Pair brake discs brembo front yamaha xp t-max 500 2007. The description of this item has been automatically translated. If you have any questions, do not hesitate to contact us. The consciousness of being a leader. Always, brembo is synonymous with technical excellence: that's why we are braking leaders for cars, motorcycles and commercial vehicles. For more than 50 years, we have equipped more prestigious cars and bicycles and we accompany the greatest pilots in their thrilling adventures: with them we have won world championships of more than 300. In each area, our goal has always been to exceed the objectives achieved and seek new challenges. To do this, the Brembo group, made up of 10% engineers and technicians, devotes a growing share of investment to field research and development (R & D). As the braking at the end of the straight line: all the steps leading to the creation of each element of the braking system are scrupulously controlled. Research and design, development and testing, manufacturing and assembly, quality control and distribution, not to mention ugly: control of the value chain is the cornerstones of our philosophy. The production process takes place internally, as it should be for a group charged with being a leader in its sector. We see ourselves as a big team that, in addition to the quality of its products, pays the greatest attention to performance, comfort and driving safety. All new products, every item we add to our range is a new success, the result of a rigorous and exciting process that comes from computer simulations and ends with the market release, having successfully undergone as much rigorous quality testing . Distance of the mounting holes. Xp t-max iron max abs 530. Xp t-max lux max abs 530. In accordance with Legislative Decree . 185, the consumer may terminate the contract within 14 working days for the goods from the date of receipt, without penalty and without indication of the reason. The withdrawal must be manifested by sending, within the 14 days, by registered letter with acknowledgment of receipt. Within this same period of 14 days must be returned by the buyer to the sender-manufacture all goods purchased intact and in their original packaging and all manuals, without any lack. The return costs will be borne by the consumer. Products may be returned only in the event that they are not used or tested or otherwise not in sales condition. Under no circumstances will we be accepted products with fault-proofing, lack of accessories provided. The right of withdrawal is not valid for those who can not be considered as consumers by Italian law. Without prejudice to the fulfillment of the above, we will refund the amount paid by the consumer within 3 days of the date of return of the goods by the customer. Details: - the law applicable to the product purchased in its entirety; - the products must be returned intact and in their original packaging, complete in all its parts including all the documentation and accessories: manuals, cables, etc ...; - the law does not apply to all products related to personal care; - according to the law, the shipping costs are the responsibility of the customer; - Shipping established upon receipt of the goods at our head office is under the responsibility of the customer; - If the goods are damaged during the return shipment, we will notify the buyer to allow him to file a timely complaint against the carrier of his choice and to obtain a refund of the value of the property (if insured); -we are not responsible in any way for damages or theft / loss of goods returned by uninsured and tracked shipments; Upon arriving at our establishment, your products will be examined to assess damage and / or alteration not caused by transportation. Therefore, borrozzinomoto reserves the right to modify or adapt the technical and dimensional information of the products in the catalog, which will be communicated by the producers, even without notice. Orders are accepted via the internet (online), or by phone. Deliveries relating to your orders will be made exclusively by GLS Express Executive Mail. Any delay will be displayed by the number of shipments, on their mail skill sites. Prices may be changed at any time without notice. Bank transfer: 2-3 days for confirmation. For any information please contact us during office hours from 09:00 13: 00-16: 00 19:00. Via dei Romani 81055 11, Santa Maria Capua Vetere (CE). 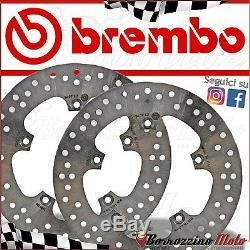 2 dischi brembo serie oro. The item "pair brake discs brembo front yamaha xp t-max 500 2007" is on sale since Wednesday, September 12, 2018. It is in the category "auto, motorcycle parts, accessories \ motorcycle \ spare parts \ brakes, suspension \ brake discs ". The seller is "borrozzinomoto" and is located in santa maria capua vetere. This item can be delivered anywhere in the world.